Hawick Lau and Yang Mi had two dramas together, A Clear Midsummer Night and As You Wish. The couple confirmed their relationship back in 2012 and got married in 2014. However, rumors have long circulated that their marriage was on the rocks. Hawick Lau was caught in a cheating rumor while filming Legend of Jade Sword with Angel Wang in Hengdian. While the married couple still seemed united in spite of the rumors, interactions between them have indeed become few and far in between all while both have chosen to remain quiet on the topic. Recently, a 26-year-old British-Chinese woman named Britney shared a picture of herself with Hawick Lau. When a commenter said that Hawick's wife Yang Mi is really pretty, Britney fires back saying, "It’s actually former wife now. They divorced two years ago." This revelation still came as a shocking news especially since Britney and Hawick to have a picture together, so they must at least know each other for her to make such a claim. Hawick's team finally speaks up and was quick to say that the photo was taken out of courtesy and that he doesn't really know the woman. His team also stated that they do not know why the netizen posted such a scandalous statement and when they attempted to verify the statement, the post was deleted and no longer there. Whether they are divorced or not, its very obvious they don't have a good relationship. This news is not surprising at all. They will keep lying for the sake of preserving the squeaky-clean image of a good marriage that they both obviously don't have. Rumors that both of them have cheated have been circulating for a while now. No celebrity will ever admit to anything that will damage their reputation, but we know the saying, where there's smoke, there's fire. They're obviously not together; I wouldn't be surprised if they have been seeing other people for a while now. I don't know if it was just senseless rumor or not,but I heard that it was a shotgun marriage for them? I just feel bad for Hawick Lau and Yang Mi because the paps and the reporters wouldn't let them off!If this divorce issue is true,I hope they could still be in good terms and have parental cooperation for the child. It was indeed a shotgun marriage because yang mi was pregnant. If she wasn't, she wouldn't marry yet. Ym get alot of hate for not being there for her daughter and her marriage on the rock. If they r divorced, it probably an open relationship. To the world they r married but live separate lives. As for hawick cheating scandal, I don't know if that's the reason behind it too. I remember reading an article Abt ym and li yifeng cheating scandal too while filming the movie fall in love like a star. Unfortunately, it is. Perhaps a poor choice now looking back. First of all, the LYF and YM rumors have no proofs and was spread by blogger and antis. LYF sued the blogger and won so let's make that clear first. YM and LYF relationship was also affected my the rumor because it's everywhere that they avoid each other now. People love to make rumors about Yangmi so much, I guess it get clicks? That's why she can't even being her normal joking self around her costars in public eyes because people would label her flirting or cheating. So what if it's a rumor or the truth? Yang Mi seemed to consider her work more important than her family anyways, at the rate she is going, they might as well be divorced. Hawick was popular back in the old days. Ym was like a b+ star at that time she dated hawick. But u choose use fame over ur family. Someday it will slowly dying down. You are either YM hater or Hawick fan because you seems to turn things around. Yangmi signed contract and has responsibilities wtih her company and many people, unlike someone else. She can't even took much break when she pregnant and gave birth. The company was only stable last year which is why she can work less now. Even she works a lot she always videotalk to her daughter and visit her when she has time. She just doesn't show it because that's her private life. Hawick also confirmed she visit her daugher as soon as she is done filming. Hawick used his daughter to clean his cheating image and even turned Yangmi to a bad mother. If you looked at his work resume he had even more dramas than her each year before his cheating scandal. But because of the scandal and his drama kept flopping, he had less offers so he had no choice but stay in HK more. YM is the one who make more money between both, should she stay home too so that they can have 'good wife" name to please you and society? More importantly, she got married to him when she at her peak. WTF with she was B-list when she was dating him? Are you serious??? YM had many hits before knowing him and was Alist after Palace. She was everywhere in 2011. Meanwhile Hawick was a Blist when he dated her and actually never had a real hit. Being with her raising his status and giving many drama offers. He is lucky to have her but even then he can't even score a proper hit. At least get some facts straights. Yang Mi was B list and Hawick was popular back then? Do we live in different Universes? In the Universe that I know, Yang Mi was A list actress after Palace in 2011. Hawick was not even main lead in TVB dramas, then he starred in some mainland dramas as lead. He actually got more popular after dating/marrying Yang Mi. 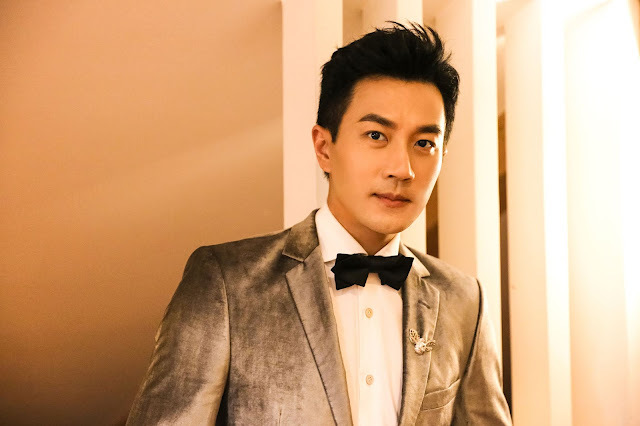 He was working non-stop even after his daughter was born (he even once said that he was so busy and little Noemie was closer to Yang Mi than him). After the night script-reading scandal, he came back home and be a good dad, his wife wad labeled as a bad mom. All this is the facts that I know, no emotion involved though. the cheating rumor is not true though. it's been proved as misunderstanding by the drama staff. angel wang and hawick lau even took legal action for the malicious rumor. and yangmi also defends her husband. the paparazzi also apologize for spreading false rumor about them. it's why hawick lau still got back up from netizens, because they know it's not true compared to other celebrity cheaters. It didn't prove anything. It's true that we don't know what he did inside but 4 hours at midnight after turning off the light. What would his staffs and YM do? Saying they cheated and they knew? Yang Mi was an A List star when she started dating Hawick at that time. She's more popular than him for sure. As for the rumour, I believe it's true. There have been too many rumours about this that it's not even a surprise anymore. Wallace and Ruby had a shotgun marriage too. Bunch of others did it's not even surprising or anything worth mentioning. the LYF and YM rumors were definitely not true, YM barely kisses her male co-stars, I've spotted body doubles while watching her dramas, it might be out of respect to Hawick. I don't see her as the type of woman that would be with another man while married, whether they are on good terms or not. She's a lot of things, but has great work ethic, so I see it as she probably knows she has the most to lose if she were caught, way more than Hawick ever could. Yang Mi was an A list star when she and Hawick started dating, Hawick got more popular due to dating Yang Mi at the time. And I don't really understand why many people say Yang Mi is a bad mom, just because she does not post any photos of her daughter or not announcing "oh, today I'm home playing with my daughter"? She said she wanted to keep her daughter as private as possible and she stayed true to her word. She onces said when she was not in working mode, she often flew alone wearing simple T-shirt with a hat and no one regconized her. And If I remember correctly, after giving birth Yang Mi stay at home for a whole few months taking care of the new born baby while Hawick was busy filmimg in the mainland and hardly home - why no one said he was a bad dad at the time? After the "late night script" event, Hawick stayed at home more and take his child to school then people started saying he was a good dad and Yang Mi was a bad mom - how is that fair? And why Hawick just deny the rumor just now? It was going around for quite sometimes now, is it because recently he has a show/performance? He is so selfish based on everything he has done so far. Yangmi deserves better. She stays true to he words and protect her daughter out of the spot light unlike some celebrities dad show off at school to show everyone I'm a good dad after his scandals. Yes, I wonder if there was no "late night script" event, would he stay home and take care of his child - just like people give him credit now, or would he accept more dramas/movies and "go home when he has time"? How can you know Hawick is not a bad husband or father? Just because what he's been showing off to the public, the image of a good husband and a good father? Like sharing her daughter's letter in his singing show. I believe he loves her daughter, but I also believe Yang Mi also loves her daughter. I advice you to give up any hopes about them ever collaborate again in a drama together. Regarding the third installment of the negotiator, it's just a baseless rumour, nothing substantial about that at all. I also believe that they both love their daughter very much. Yup, I just wanted to say that we cannot judge anything only from the surface. Stardom and privacy - what a price to pay! People's comments, innuendos, and judgements hurting other people's lives and relationships. How do you know that what you read is true or are you perpetuating the lies ... does it make you feel better about yourself to spread it or to think less of others. Paparazzi/People making money to sell story and spreading rumors (really bad karma), whether it's true or not why do we need to help them fan the fire. Who are we to judge, it's their life not ours. If the shoe was on the other foot, would you judge people the same way? Can we respect the actors/actress privacy because I really enjoy seeing their work ... I don't want them to feel a need to disappear or take a break in the USA like HuGe. I've witness "what comes around goes around" ... so lets hope that if one day you get struck by the stars, you don't get 'special fans' and paparazzi on your path. And if not star struck, then in your personal life people will be judgemental towards you. I wish all the actors/actress a wonderful life and success. Thank you for giving me something to look forward to after work. This person is definitely a Yang Mi fanatic! Only the crazy Yang Mi fans would go cursing others like this and trying to deny anything that makes their idol look bad. OMG. This person is definitely a fanatic of foul literature or a paparazzi in denial and accusatory. A fan on fire - careful not to burn yourself. Do you know YM personally that you feel that way and go crazy? She's a person on TV, don't you have a real life to live? And real annoying people in your life to fend off? Somebody definitely needs to get a life—I see a Yang Mi fanatic writing pages and pages more than anybody else (just look at the comments) and now literally cursing people who make observations and comments. Typical hypocritical, terrorizing behavior from Yang Mi fanatics. But I kind of love to hear the crazy barking; it’s like watching a really bad train crash. Lol. Be careful, Dramapanda writers; there’s a nutty Yang Mi fan out there who wants to police news/comments and even wishes people get “struck by the stars.” Lol. So much crazy out there! I'm not Chinese and this is my first post ... I don't know how YM fans are, but from reading your literary work you sound as bad as the accusation you make of others - cursing, terrorizing, policing, and barking against someone asking for respect of others and their privacy. Did she turn you down or something? She got more fans than you? You're a struggling actor/actress - are you jealous? Did your guy leave you for her? Are you an author of many fanatical foul literature - did I touch a nerve? If none of these then let her go, let her fans go ... there are bigger problems in life then to harbor such feelings against someone who have no impact on your life. She's not even a politician who make rules and laws that will affect you and everyone else. If she hadn't won 2017 World Fest International Film award, I wouldn't even know her name. Bark on, Yang Mi police! What's wrong with the person above me? Nobody offended you here. Yang Mi's fans do not sound as bad as you describe and you definitely sound worse. Most likely an author of many foul literatures and then troll commenters that he/she doesn't like. The things we do and say will reflect back in our lives ... if you give negative, you'll receive negative ... if you give positive, you'll receive positive in return. Wish you well ... take care. What the freak? Wow, I read over and over and all I see Anon 11 saying is to mind your own damn business and stop being so happy just because some bad news happen to some celebrities. Wow, the YM haters are sure so plenty and horrible, I really wonder what she'd ever done to offend them to this extent. Did she stole the beauty prize from you or the successful woman status away? Next up the haters will deny her being pretty and successful, then why the hate? You are jealous that you are a better human being? Because you are so good, you yell at others for not being as good, do you even know them? You don't know them, you could've just hate any random person on the street with a true/false rumor that you don't even know, but you choose to attack these celebrities because they are famous? If the rumor is not about a private family thing, but anything as despicable as Edison Chen then we can all say how nasty a person is, but YM issues is such a family matter thing. It is really both their business. When the time comes, we will know if they did get divorced or not. No surprise here. They've had a distant relationship with cheating rumors on both parts running everywhere and reports of all sorts of dysfunctional family problems, but they care too much about their business and image to make a divorce known.